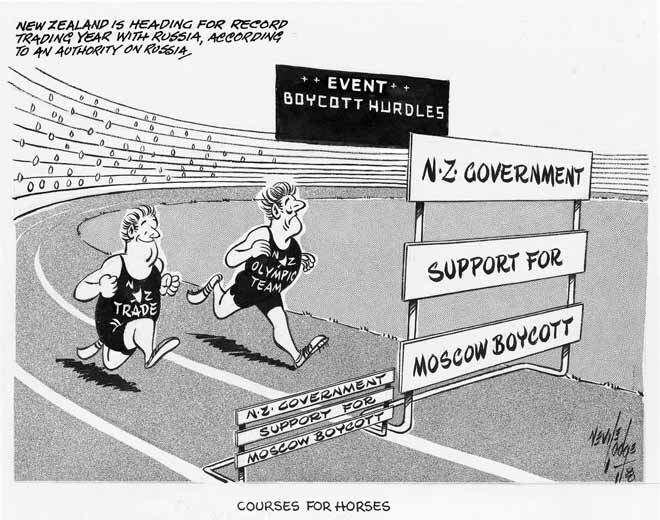 Following the Soviet Union's 1979 invasion of Afghanistan, New Zealand joined a United States-led Western nation boycott of the 1980 Moscow Olympic Games. The government put considerable pressure on New Zealand athletes not to go. The cartoonist contrasts the government’s promotion of the boycott with its support for growing trade with the Soviets. Permission of the Alexander Turnbull Library, National Library of New Zealand, Te Puna Mātauranga o Aotearoa, must be obtained before any re-use of this image.